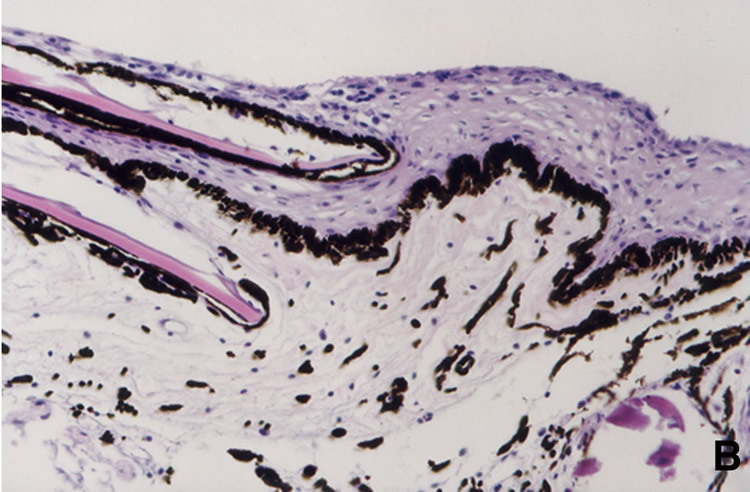 Melanotic Hyperpigmentation Cross section of the caudal peduncle showing hyperpigmentation restricted to the integument (70 x). 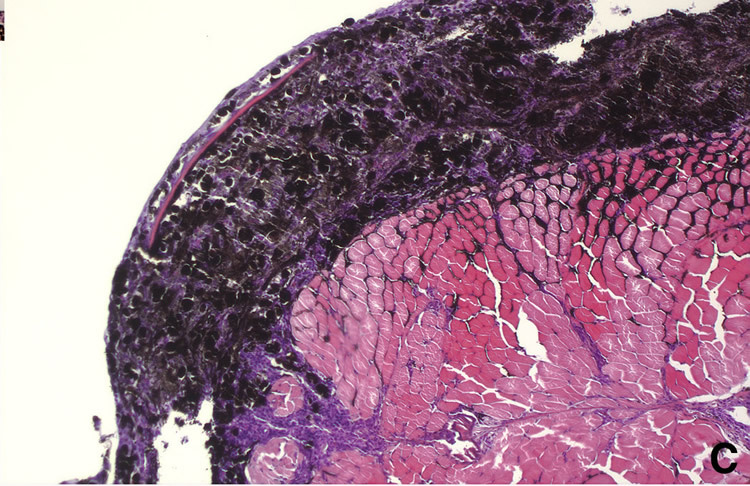 Pre-cancerous Melanosis Fish skin showing aggregations of pigmented cells along the skin-dermis junction, around the scales, but sparse in the dermis (175 x). 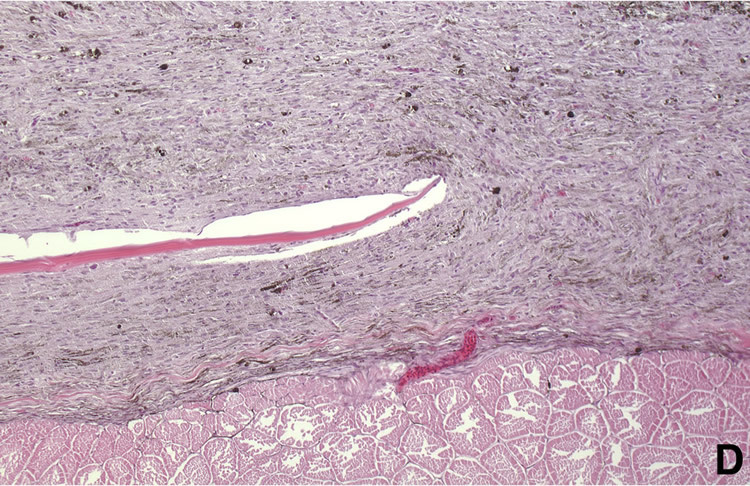 Melanocytic Melanoma This exophytic tumor shows the penetration of melanocytes into the dermis but the lack of invasiveness into the underlying muscle tissue. 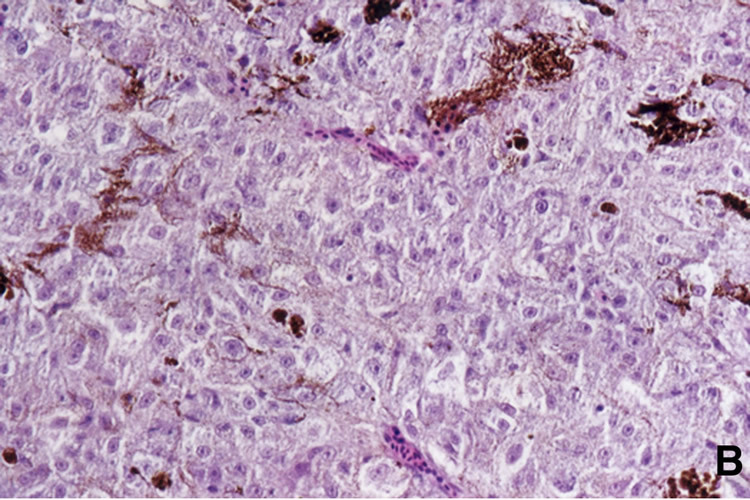 A higher magnification showing the predominant type of tumor cell, dendritic or spindle shaped. Their nuclei are oval and regular, and some cells are heavily pigmented (250 x). 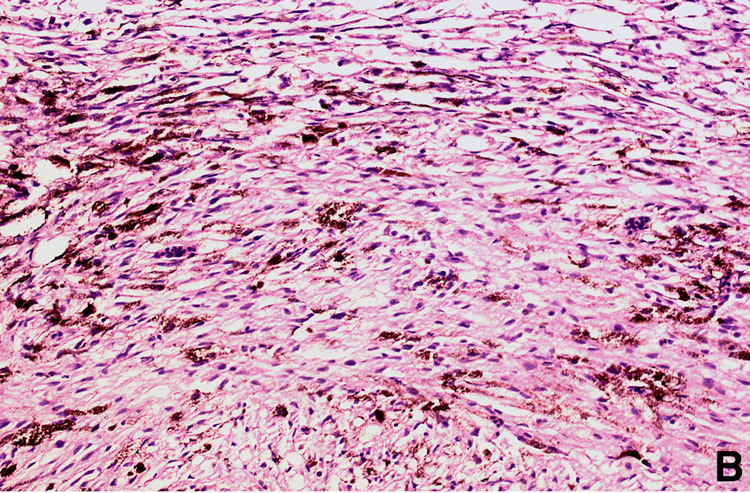 Spindle Cell Type Melanoma This tumor shows heavily pigmented spindle cells (175 x). 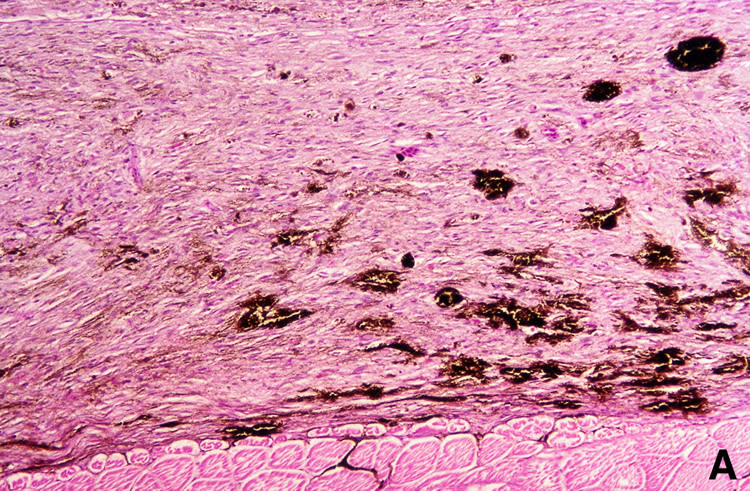 Higher magnification showing fusiform cells with elongated nuclei and abundant melanin in the cytoplasm (500 x). Epithelioid-Cell Type Melanoma Exophytic growth composed mostly of epithelioid cell types. 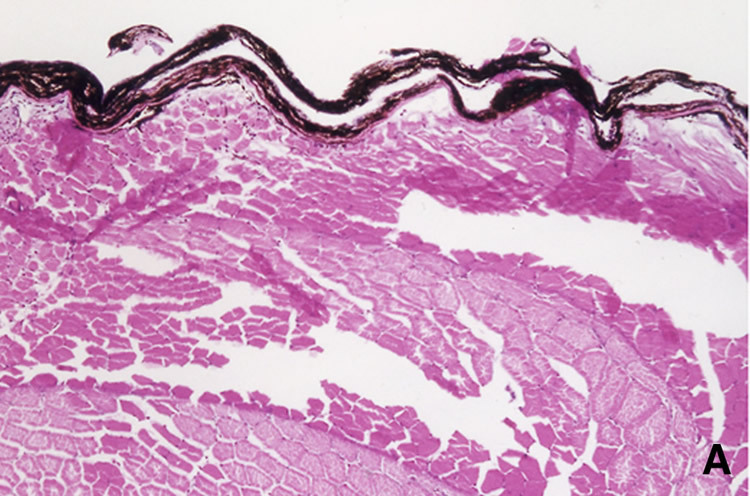 Blood vessels are sparse throughout the whole tumor (70 x). 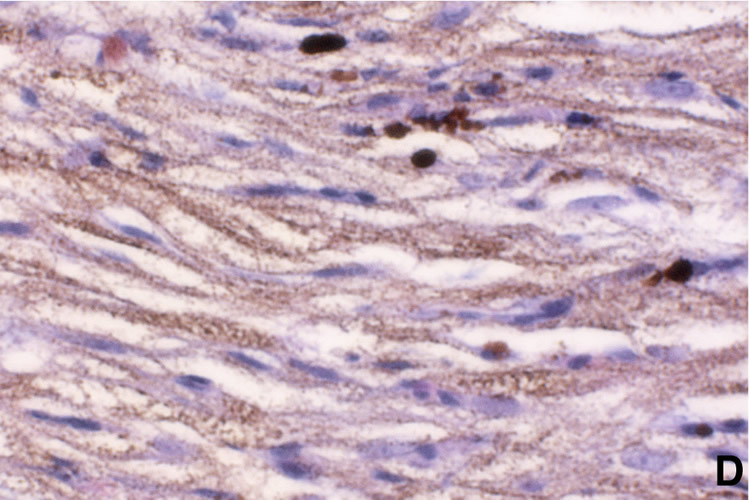 Higher magnification shows cuboidal-shaped cells with oval nuclei and dusty cytoplasmic melanin pigment (1000 x). Melanophore-Macromelanophores Polymorphic Melanoma Cross section of a heavily pigmented tumor. 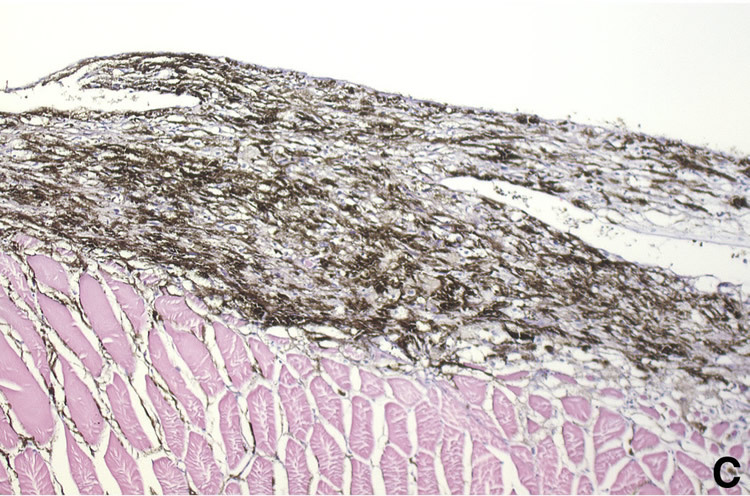 Pigmented cells are invading the musculature (70 x). 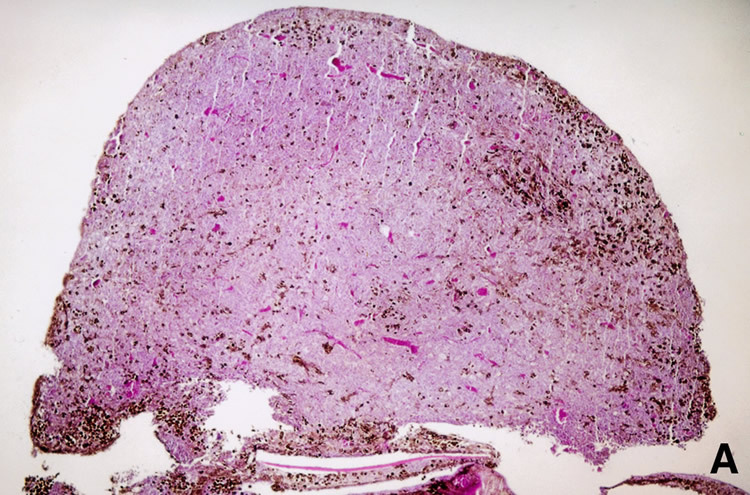 Amelanotic Melanoma This tumor is located entirely in the dermis and do not invade the musculature. Most cells do not contain melanin, but in some small areas that are lightly pigmented cells (125 x).